Wheat has been a domestic crop for about 10,000 years, and refining flour by removing the bran goes back to the ancient Egyptians, who removed the bran using papyrus sieves. However, the refining process was not perfected until the creation of the roller mill in the 1820s. Bleaching of flour has also been done for centuries, but it was done by aging until the twentieth century. 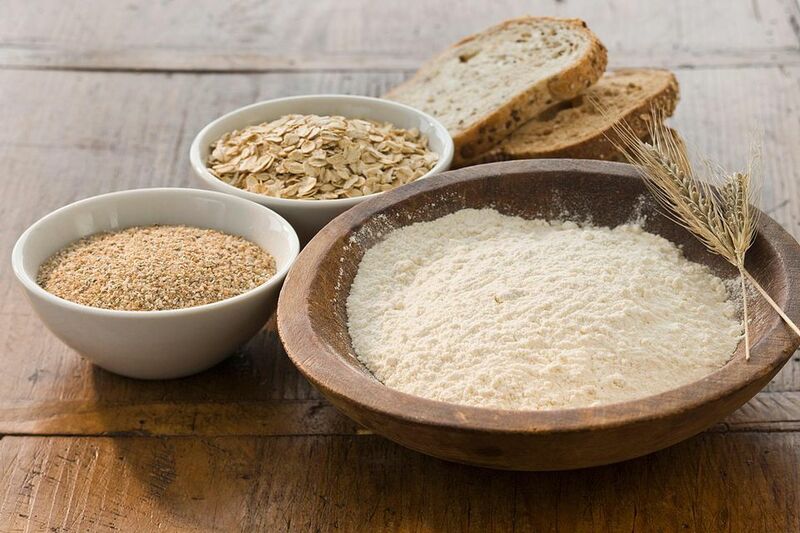 Storing wheat flour for long periods - of up to a year - causes the creation of natural enzymes that bleach the flour organically. Of course, this made bleached flour expensive, and available only to the privileged. Around the turn of the twentieth century, the process of chemical bleaching was adopted and white flour became available to the masses. So, even though the "upper crust" have been able to obtain a form of refined, bleached flour for centuries, it became available to the masses only a little more than a hundred years ago. Wheat is classified by several different characteristics: when it is grown - spring or winter wheat, its color - red or white, whether it is "hard" or "soft", by the amount of protein it contains, and by the amount of a specific protein, called "gluten" that it contains. Red wheats require more bleaching than white wheats, so white wheats generally command a higher price than red ones. The outer covering of a wheat grain is the bran. The inside part surrounding the wheat germ is the endosperm. Hard wheat is called "hard" because its kernels can seem almost as hard as flint. The kernels of hard wheat usually have a shiny endosperm. Soft Wheat, on the other hand, has a soft endosperm. Hard wheat is has a high gluten content and is used for bread flour and whole-wheat flour. Soft wheat kernels tend to be oblong, softer, and usually are not shiny. Soft wheat is lower in gluten content and is the main constituent of cake flour and pastry flour. Gluten is a kind of protein that gives elasticity to dough, helping it rise and keep its shape and often gives the final product a chewy texture. Durum wheat is the hardest wheat grown. This kind of wheat is used to make semolina flour for pasta & bulgur. It is high in protein, particularly gluten. It is occasionally used for some types of bread. Hard red spring wheat is a brownish, high-protein wheat used for bread and hard baked goods. Bread Flour and high-gluten flours are commonly made from hard red spring wheat. Hard red winter wheat is a brownish, moderately high-protein wheat used for bread, hard baked goods and is sometimes mixed with other flours to increase protein in pastry flour for pie crusts. Soft red winter wheat is a low-protein wheat used for cakes, pie crusts, biscuits, and muffins. Cake flour, pastry flour, and some self-rising flours with baking powder and salt added are made from soft red winter wheat. Hard white wheat is an opaque, chalky, medium-protein wheat that is used for bread and brewing.